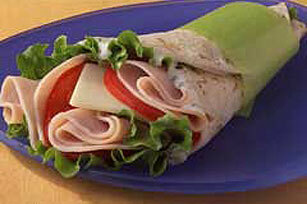 Pack something unexpected in tomorrow's lunch—like this Easy Turkey Wrap! With ranch dressing and a tortilla, this turkey wrap is sure to please. Sandwich can be made ahead of time. Wrap tightly in plastic wrap. Refrigerate up to 12 hours. Substitute MIRACLE WHIP Dressing or KRAFT Real Mayo Mayonnaise for the ranch dressing.